“People have already expressed dissatisfaction with the notch on the iPhone X, and some don’t like it at all,” Brenda Stolyar writes for Digital Trends. MacDailyNews Take: We’ll learn to live with it. That’s not really something we’re used to saying with an Apple product (outside of Apple TV’s Siri Remote), but there you have it. And yet next years iPhone Xa won’t have it…..
That’s encouraging. Apple will fix its mistake next year. That just begs the question why Apple allowed the mistake to occur at all? That would be because we live in the first world. Every review I’ve read says the notch is annoying for about a day. Then it disappears and you’re entirely used to it. Note sure why MDN feels the overwhelming need to bang this drum, but for everyone else: the notch tells you where the FaceID camera is, and which way is up. 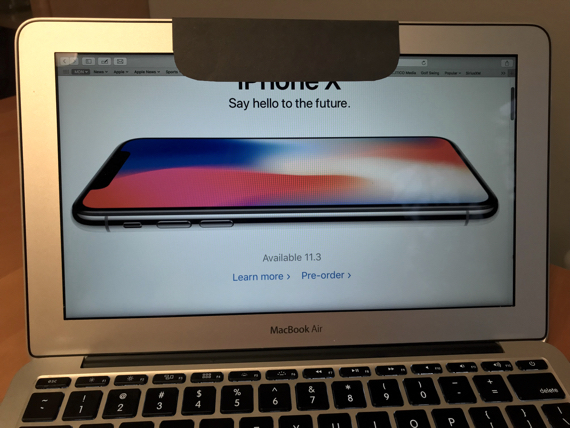 The half-baked “ideal” iPhone X mockups with a slightly thicker bezel on the top than the bottom would have people picking up their phones upside down all the time, and grandmas around the world swearing that their FaceID doesn’t work because they’re holding the sensor in the palm of their hand and making eye-contact with the bottom bezel. Once and for all, the notch is essential for this iPhone. And no, none of you are better designers than the Apple Team that designed the notch. It’s an “inelegant kludge” as MDN says. Very unlike Apple. Users may quickly develop “Notch Blindness,” but it’s a formatting mess for millions of apps and developers. I’d prefer if Apple did as MDN suggested and reserve the “bunny ears” for iOS signal indicators on a deep black background. Users wouldn’t mind that one bit and neither would developers. Having something occlude fullscreen videos is a poor solution. How do you know? You realize that your brain does this type of sensory exclusion as a routine matter all day long, right? The deep unconscious part of your brain known as the thalamus filters out about 99% of sensory input from your body, including visual input. This is how people adapt to early cataracts, floaters, low light and eye movement. The notch will most likely trigger this same adaptive response. This means the notch will likely disappear or even become a familiar part of the phone’s visual pattern that will become the way we visually identify it and match it to a positive expectation. We’ll have to wait to see what happens in mass adaptation or at least until you live with it for a few days. It appears that should you decide to wait for a differe form factor, plenty of the rest of us are willing to test it for you. 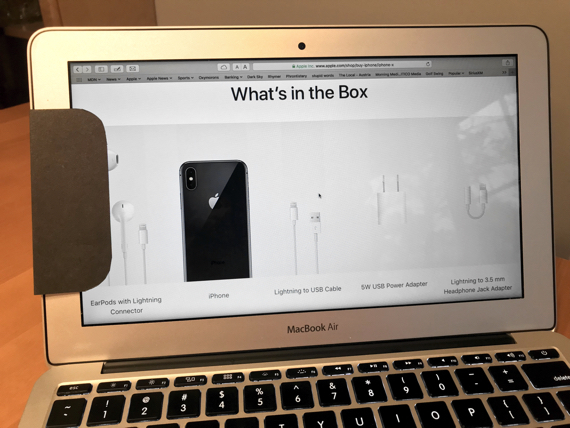 The brain is amazing at sensory exclusion but as long as other displays that iPhone X users may use in their daily life does not include a notch, I have a feeling it may be more like a person getting used to an odor stepping out to fresh air and returning to find the odor has to be experienced again. Now imagine that happening a number of times a day. That might be worth experimenting with. How ‘off’ can your eye-contact be and still unlock the phone? Can you unlock it in landscape mode? MDN is spot on and I admire their courageous attempts in the face of critical and mocking fanboys. I’m not a fanboy. I’m a neuroscientist. I did not say that the notch was “necessary to orient others.” I said that the brain would likely make it disappear and that it is likely to become a visual cue to a positive expectation. That’s how brains work. I did find MDNs pics amusing. Trouble is if the added notch they created was simply extended to the full width of the screen it would still be irritating infact I suspect more so, so it’s only the easily fooled who would take it seriously as a proof of MDN concept. But yes as I say amusing. Really getting tired hearing about “the notch” like Higo said, pretty much all the reviewers are saying you get used to it after a day or 2. I honestly love it, it’s distinctive and actually gets used instead of just keeping them blacked out. You only prove that some people are willing to accept anything. I guess you can get used to an armless Venus de Milo too. Not one of your best analogies, botty, because the Venus de Milo is generally regarded as an incredible work of art. You might want to try again. But, oh, how much more better it would be fully intact? Your merely making excuses, because the sculpture did not at the end of his work take a 10-lbs sledgehammer to his art, but Apple apparently did. That sculpture is ‘complete’ would have ‘set’ the position of the arms. As it is w/o arms it is considered a work of art that stirs the imagination into imagining what position the arms could be in and in its way presents an infinity of possibility. The notch does no such thing. The iPhone X notch is something “added” – it is there to see. In contrast the Venus de Milo has lacked arms for a long time. Similarly, the Sphinx’s nose has been damaged for a long time, although it is still deteriorating. You need to find an example where the object includes a distracting feature, like your posts. Al-Dahr was hurt by reports of prominent western travellers ridiculing the Sphinx’s proboscis, and thus had the prominence destroyed out of misplaced vanity. Napoleon’s cannoneers finished the task. The real mystery remains, however—no one knows what the nose knows. it’s no mystery, Al-Dahr was a rhino…a 14th century John Boehner. …read that in last Sunday’s Al-Schnozzeera. Right. A periodical specialising in Jimmy Durante ethnic jokes, translated into farsi from the original yiddish. Another instant fake avatar from a cowardly regular reader, no matter. As a bonus for the first million iNotches sold, Pipeline Timmy is throwing in a free “Dogs Playing Poker” velvet painting. Make it a Velvet Elvis and I am sold! Keep trying, botty… You will stumble into something funny eventually. Botty’s worst day is better than your best day. Apple has lost its taste because of one notch? That the notch somehow represents an absence of original ideas and culture? That is what you are implying, botty, and it is ridiculous. I would encourage you to try again, but that would be the definition of insanity, because the same thing *will* happen again. No, he’s just explaining why he has no taste. Ask this question again Saturday. I’m still not over the camera bump, so see you Saturday. Forgot about that. TWO Apple design BOTCHES. My favourite part of that movie was when the grizzled old miner convinced his partners, after they’d sluiced off all the gold, to do the hard work of putting the mountain back together, and then saying, “thanks, mountain.” Old guys respected the land, and understood karma, and didn’t need no stinking environmental regulations to force them to do the right thing. Hard to decide which one is his best…Caine Mutiny character is similar, Queeg was a lot like Dobbs. Maltese Falcon is still my #1 Bogie. All the movies you mention are absolutely great. Like TOSM, High Sierra is also at the top of my list. Big Sleep was a breakthrough flick. Key Largo a mob masterpiece and the one where Bogey, or is it Bogie, breaks out of prison and holes up with Bacall in her San Francisco artist apartment. Great period visuals. oh, you mean “Dark Passage”…an odd film. Agnes Moorehead falling out of window was best part. Yeah, the WITCH got what was coming to her. a great, great movie…I liked when they beat the crap outta Barton MacLane in the bar for screwin’ ’em on paycheck. …and, of course, Max Steiner’s great score. Runner up was the Federalist police that jailed the bandits, then followed with the firing squad in the market square. The defiant facial expression behind bars of the jailed leader is priceless. Howard: We’ve wounded this mountain. It’s our duty to close her wounds. It’s the least we can do to show our gratitude for all the wealth she’s given us. If you guys don’t want to help me, I’ll do it alone. Dobbs: She’s been a lot better to me than any woman I ever knew. Keep your shirt on, old-timer. Sure, I’ll help ya. Not for nothing has the Earth been singled out by every culture as a fecund force unto herself, the only god(dess) that really matters to every single human. – Allah may promise every brash young jihadist a noble death and infinite reward for killing unbelievers, but has little to say for the rest. I wonder about the muslims killed by suicide bombers. What was their reward for believing? Precious little, I am given to understand, compared to the paradise posthumously occupied by these sanctified murderers. It is impossible not to see holy war as a perversion of the religious instinct. In fact, it looks exactly like a plot Satan might have thought up to ramp up the death rate and keep Hell well-populated, after humans were able to overcome the famine and pestilence plans. Plan C is working out even better than Plans A and B.. thanks to the ineffable gullibility of humankind. …some say Satan’s greatest achievement was convincing the world he doesn’t exist. I’ll just pretend you didn’t really type that. heh, good for Houston, they’ve had a tough year…the great thing about baseball is that in a best of seven, the best team truly wins. This sounds like all that nonsense about the headphone jack. No headphone jack! It has a notch! The sky is falling!! !